In our March 26th post (Aoraki/Mt. Cook National Park), I remarked that the South Island reportedly has most of the superlative sights in NZ. Many of those sights lie in Fiordland, New Zealand’s largest, most remote and wildest national park. It is a region of stunning beauty, boasting some of the tallest waterfalls in the world; its glacier-scoured lakes are the deepest in the country, some nearly 15oo feet deep; its coastline sports 14 glacier-carved fiords, some nearly 25 miles long. (Note: the fiords were misnamed as “sounds” by early sailors; a fiord is formed when a glacier grinds its way to the sea [and then melts]; a sound is a sea-drowned river valley). Fiordland is also an isolated, almost inaccessibly wild land, bordered by the Southern Alps on one side and by steep fiords on the other. It endures enormous rainfall – it rains more than 200 days a year. Milford Sound, where we’re headed, gets 27 feet of that wet stuff annually. Of its 14 fiords, only 2 (Milford and Doubtful) are relatively easy to visit. The Maori visited Fiordland but did not live there. In 2001 the total human population of this vast land was 48 souls. If you include border towns like Te Anau, the population today is still under 2000. Isolated, yes, but there’s probably a correlation between low human population and the large numbers of the infamous sand fly (called “black fly” in the US), a tiny, blood-sucking critter with an incredibly vicious bite – they’re more like flying piranhas than insects. This inhospitable remoteness does have some benefits: some of the animals and plants of the ancient super-continent Gondwana still exist here (eg. living brachiopods, unchanged in 300 million years); and in 1950 the takahe, a flightless bird that had been believed to be extinct for 50 years, was rediscovered in Fiordland. We can’t wait to see this area. We spent a bunch of money for an overnight cruise on Milford Sound; now we have to get there. The plan is to high-tail it to the gateway town of Te Anau, spend the night, and get an early start for a leisurely trip along the 70 miles of Milford Road, billed as one of the world’s finest drives, before boarding our 60-person cruise ship. Saddle I think we see vineyards nearby. Oh yeah, we’ll be back soon to visit! of the area as the sun sets. The impressive views suggest a fabulous tomorrow! Equally fabulous was our B&B; it’s a restored monastery, beautifully done inside. 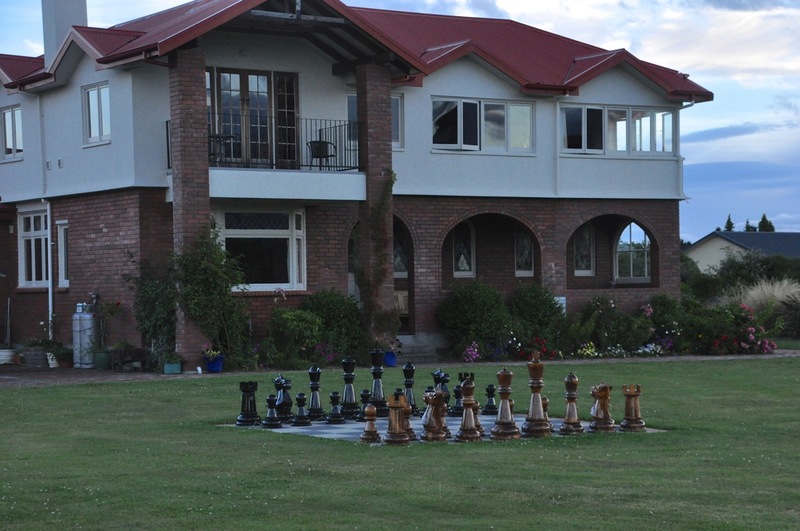 We were there for too little time to really appreciate it; for example, the outdoor mega-size chess set, the free port and gay laughter we could hear in the upstairs lounge as we went to bed….. darn it, can’t do it all! The next morning is disappointingly overcast, with rain clouds on the horizon; looks like we’re going to get one of those 200 days of rain. Drat! And sure enough, clouds and rain are our companions through some magnificent valleys. I think the views would be spectacular in shimmering sunlight, but it is still beautiful in the mist. A popular tour-bus stop (Milford Sound is such a tour-bus mecca!) is Mirror Lakes, right by the highway. We stop too. In good weather there are outstanding reflections of the Earl Mountains. Even in the rain, the view and color is nice. The cute duck is a NZ Scaup. We go further to Lake Gunn and decide to do the 2 mile nature walk. Glad we did – it’s a good insight into the effects of 27 feet of rain! The walk is a riot of mosses of every kind growing on everything, and plants growing on top of the mosses! Trees are a vertical extension of the forest floor! It’s beautiful, as you can see in the many images below, but we were afraid to stand still for long. We continue, up and up, to the Homer Tunnel, carved nearly a mile through the solid stone of a glacial cirque. 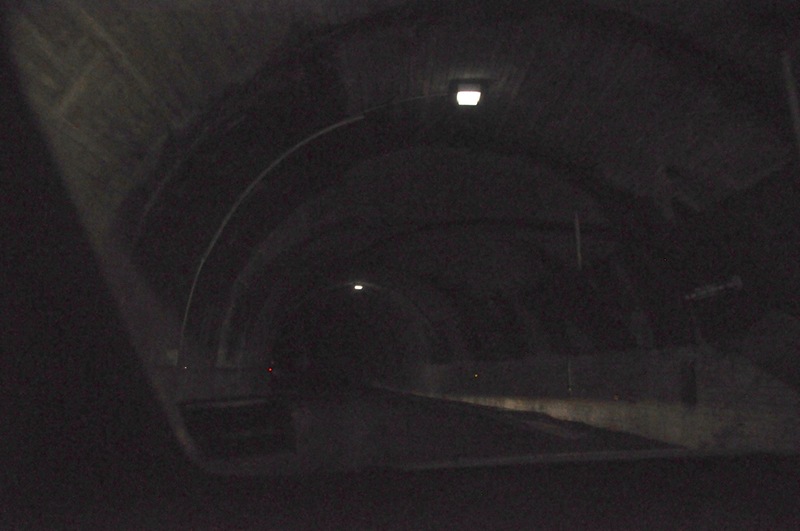 The tunnel was quite an engineering feat, started in 1935 and finished in 1953. It took so long in part because the downward angle quickly ran into water and in part because of interruptions by several avalanches and WWII. What is novel to us is that it’s a one-lane road! While we wait for our turn to go through, we are entertained by the numerous waterfalls pouring down – and the inquisitive and highly intelligent kea, the world’s only alpine parrot. While we watch a kea on a car roof, it grabs a hard plastic cover over the tailgate hinge and rips about a fourth of it off! As it works on the remainder, we inform the inhabitants that their car is being eaten. The man steps out holding a short piece of 2×4 (be prepared?) and swats at the parrot, which nimbly hops to the front of the roof, out of swinging distance, but still on the roof! Catch me if you can! I am impressed, and hurry back to my car to make sure the gremlins aren’t there. The redeeming virtue of the parrots is that they’re so cute! They walk like sailors newly on land, a rolling gait, and appear fearless. Finally, after a 15 minute wait, it’s our turn, and off we go into the tunnel. It looks old! The stop lights governing traffic into this tunnel are only used in summertime; in wintertime, it’s every man for himself, which could mean backing out a loooong way. I’m betting there are spirited “rock scissors paper” games when 2 cars meet. Of course in wintertime chains are required, avalanches are a problem, and then you have to wait while maintenance workers in helicopters drop dynamite on the snow overhangs. Maybe the stoplight wasn’t so bad! 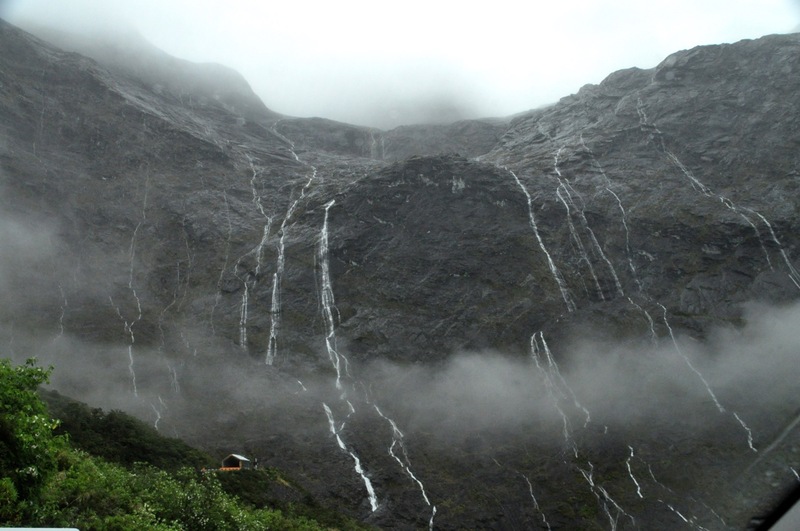 We exit the Homer Tunnel into a whole lot of waterfalls coming from a massive cirque. Just for perspective, the tunnel exit is the roofed structure in the lower left of the picture. Waterfalls are absolutely everywhere; it would be crazy to show close-ups, so just enjoy the overviews as we drive down! Finally, we visit another tour-bus stop, The Chasm, where the Cleddau River scours rocks into interesting shapes as it falls nearly vertically down a deep, narrow channel. We’ve now arrived at Milford Sound. Rainy and overcast! There were many other hikes to take from the Milford Road, but they were longer and we ran out of time; we board the cruise ship shortly at 4pm and just have time to take a quick look around. Next post – The famous Milford Sound! This entry was posted in Fiordland National Park, New Zealand, South Island. Great, informative article – can’t wait to get down to Fiordland myself!